Power all with the Powerwall! If you haven’t heard of the new Tesla battery, you may be living under a rock. Tesla’s new battery is the talk of the town and it’s everywhere in the media. Why? It aims to take homes and businesses off the grid. 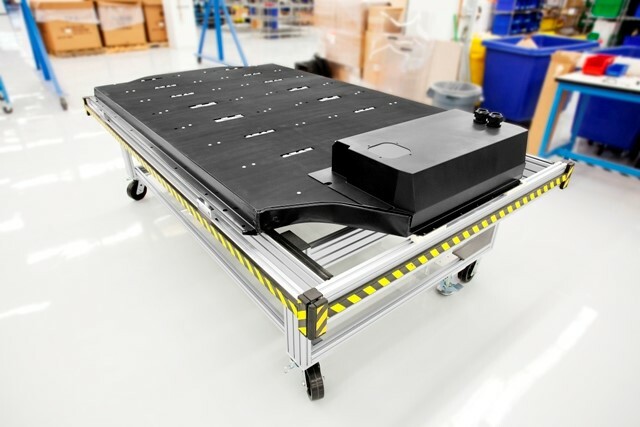 What is the Tesla Battery? The new Powerwall Tesla Home Batteries are lithium ion batteries that come in two sizes – 7kWh and 10 kWh – and are combined with solar panels. The 7kWh battery is for daily usage and is designed to be mounted on a wall while the larger counterpart is stored for backup when the electricity may go out. The battery charges during off peak times when the rates are lower. The 7kWh batteries, when paired with other batteries, are sufficient enough to store customers’ generated electricity and use it during those expensive peak hours, or when the sun goes down. The start-up costs begin at approximately $3000 to $3500 and may be more before installation, making this new upgrade a less desirable option for many consumers. Tesla batteries are said to decrease in price by at least 50% in the next 10 years making them more affordable for homeowners and making them more practical in our daily lives. When energy is generated in excess amounts, the unused energy is stored within a battery. 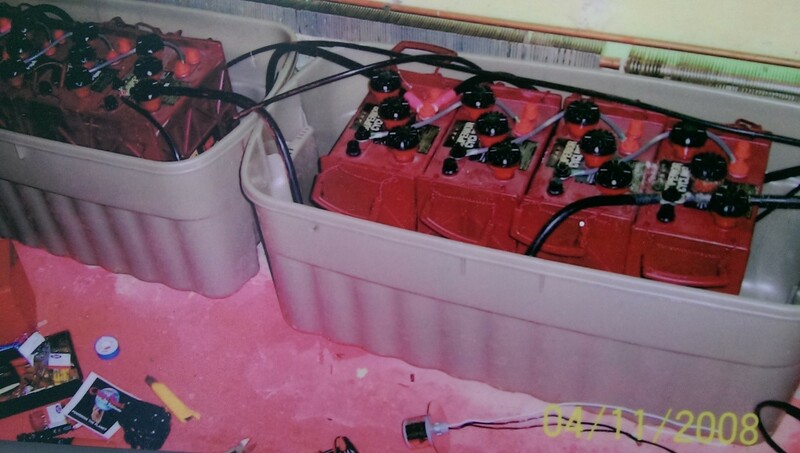 When a battery is not present to store the energy it is often sold back to utility companies and then sold to customers later when they need it. In Ontario, we have to get people to pay us to take our excess energy at night time. The utility companies end up making money from the power you generate. 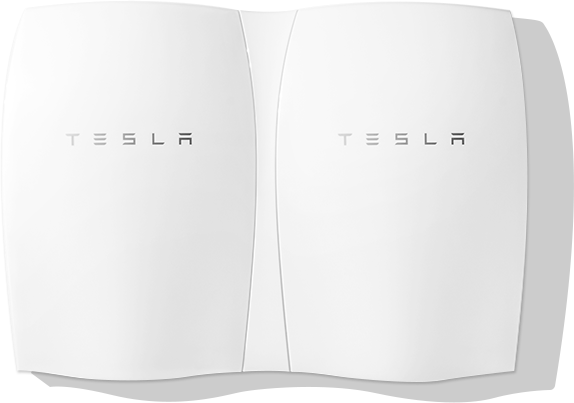 The Tesla battery allows you to store the energy you make from solar energy and use it when you need it. Not only does it provide an economic benefit to home and business owners, but it also provides benefits for the environment. Green Venture currently has two solar systems and a wind turbine on site to harvest renewable energy. We hope to replace our current batteries with the Tesla battery as soon as possible. The investment will help conserve more energy and will allow us to explore newer technologies and implement them into our daily lives. Right now we are using a battery bank, 24v dc system. We plan on using the tesla batteries in conjunction with our solar panels that we have on site. The power we save, we can store and use in the EcoHouse or to power the on-site Community CarShare Plug-In Prius Hybrid. During blackouts we will still have power at EcoHouse and be able to go about with our daily activities. There are endless possibilities with the new Tesla battery here at Green Venture! Community CarShare comes to the East End! Green Venture has decided to do the green thing and trade in our two company vehicles for a Community CarShare membership. Community CarShare is a local non-profit co-operative organization. They were the first car sharing organization within Ontario starting in 1998 and have been a part of the Hamilton community since 2009. The Community CarShare program is really simple. First, you sign up for a membership plan that is based on your needs. Once you are signed up and have received a safe driving orientation you are able to book any of the 53 CarShare vehicles (with 13 in Hamilton), and you are able to book up to 30 minutes in advance. The car is then charged on a pay-per-use basis. You are able to pick the type of car you need and then head to the closest available location to pick up your car, it’s as simple as that. You don’t even have to pay for gas, maintenance, or insurance, they are all included in your membership fee. 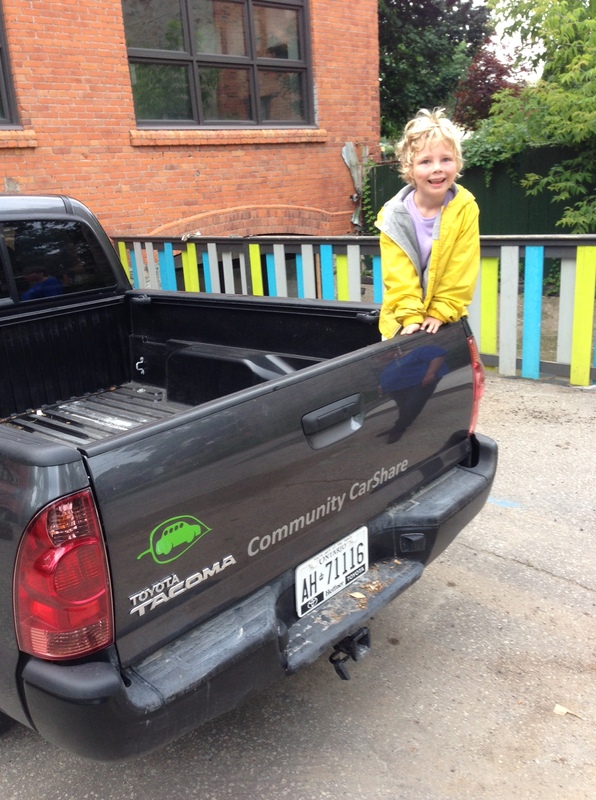 We used our Community CarShare membership to book the Toyota Tacoma to help us get everything for our booth from the EcoHouse to the Open Streets festival in Hamilton. Our helper with the CarShare! king space you can potentially rent it out and make a profit! At Green Venture we did the math and we will be saving over $5000.00 dollars a year by switching to CarShare! Social: You are contributing to a local co-operative organization within your community. You are also avoiding the stress of managing and maintaining a vehicle and lastly Community CarShare has made picking up and booking a car convenient and hassle free. Environmental: By ditching your ride and joining CarShare you are diminishing the amount of cars on the road. This helps reduce CO2 emissions, while also reducing the amount of traffic and consequently the amount of idling on the streets, bettering our air quality within the city. Lastly if you do not have your own vehicle for transportation traveling becomes more of a conscious decision. This allows people to become more aware of their transportation choices and consider more environmentally friendly decisions such as CarShare, biking or walking. The Toyota Prius PHV plugged-in and recharging its batteries. 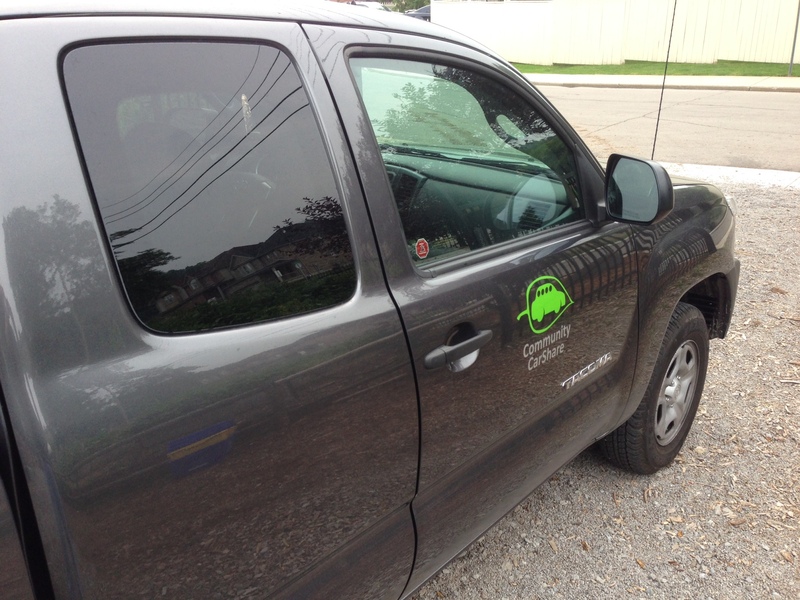 Green Venture is taking the environmental benefits one step further by introducing an electric vehicle into the Community CarShare organization. At Green Venture’s office building, called the EcoHouse, we have an Electric Vehicle (EV) Charging Station, which was donated by EATON. The EV charging station is a place for plug-in cars to recharge and collect electric energy for their vehicles. The EV charging station will soon be the new location for the Toyota Prius Hybrid Plug-in (or Prius PHV), for Community CarShare. This hybrid utilises rechargeable batteries while in all-electric running mode, that only take two to three hours to charge and the vehicle can maintain high speeds and last a long distance. When using the Prius PHV compared to other gas guzzling cars of the same size you will be reducing your fuel consumption by 1650 litres and even better lowering your CO2 emissions by nearly 4000 kg per year! By Green Venture using not only CarShare but an electric vehicle we will be significantly reducing our carbon footprint and continuing our goal to live more sustainably. In terms of electricity costs, I was wondering what the “Global Adjustment” (GA) is and how much the Feed-in-tariff (FIT) program is responsible for in overall GA costs. So, I wrote the good folks at the Ministry of Energy and received the response below (eventually ;-). I found the response helpful. All consumers in Ontario pay the blended (or commodity) cost of electricity. This is comprised of two components, the market price for electricity and the Global Adjustment. The Global Adjustment pays contracted and regulated generators the difference between their rates and the market rate for electricity. The Global Adjustment also covers the cost of conservation programs. The Global Adjustment was introduced in 2005 to ensure that new generators had sufficient revenue certainty to warrant investment in Ontario’s electricity system. Since that time Global Adjustment has been successful in delivering stable prices as well as ensuring that capacity is in place to deliver a reliable supply of energy. Global Adjustment costs for most consumers have increased significantly in recent years; however this increase has been accompanied by a decrease in the market price for electricity. The net effect is that the increase in the blended electricity price has been limited. Electricity bills are increasing in nearly every province, even those that rely predominantly on coal and hydroelectricity. The Global Adjustment reflects the non-market costs associated with contracted and regulated generation such as nuclear, natural gas, and renewables, as well as the cost of conservation programs. In 2011, non-hydro renewables accounted for about 10 per cent of global adjustment, and the Feed-in-Tariff program made up about 1 per cent of a typical consumers bill. I hope this information is helpful. Should you have any further questions of a general nature, please call the ministry’s information line at 1-888-668-4636, TTY 1-800-387-5559. Start a Community Solar Coop in Your Neighbourhood! As providers of solar PV installations under the Ontario microFIT and FIT program, Green Venture is very pleased to invite you to find out how to start, or participate in, a community solar PV coop. See info below from our good friends and partners at Environment Hamilton (thanks Juby!). Environment Hamilton has partnered with OSEA (Ontario Sustainable Energy Association) to deliver a workshop on Wed. Nov. 9th entitled “OSEA’s Community Power Roadmap to Success”. This event is all about connecting local businesses, community members, and organizations and providing them with the basic tools to create community-based solar-power projects. This is great opportunity to learn more about how to tap into creating solar power projects within Hamilton. Central Branch – Hamilton Public Library, 55 York Blvd. The exciting increase in solar power opportunities speaks to the environmental and financial benefits of this green energy. We have local examples of Hamiltonians connecting to this power source. One of the challenges of solar is the financial upfront costs as well as location requirements pose a challenge to make putting up solar panels feasible. The Ontario Sustainable Energy Association (OSEA) is holding a hands-on workshop that will give participants tools to create our own community-based solar power projects. And ideally, connecting businesses, community members and local organizations, so that individuals can come together and share the challenges and successes of solar energy production. We are seeing examples emerging here in Hamilton, such as Melrose United Church putting up solar panels this month. OSEA’s workshop aims to have its participants identify opportunities to have community solar powered projects and give them the tools to achieve those goals. Just in case you missed it, below is a copy of the letter sent by the City of Hamilton to the Premier requesting for a moratorium on industrial wind turbine development. Hamilton City Council Motion “Request for Moratorium on Industrial Wind Turbine Development”. AND WHEREAS the City of Hamilton has endorsed sustainable development, clean technology, and poverty reduction as preferable patterns of development much in line with the UNEP statements. (b) That the City of Hamilton hereby calls upon all provincial political parties, their leaders, and local MPP candidates to respect the importance of the Green Economy to Ontario’s economy, to Ontario’s energy future, and to the environment. District Labour Council, Environment Hamilton and continues to develop relationships with as many people and organizations of goodwill as possible. 1900 leaflets were distributed at the recent Festival of Friends, as well as a petition being generated during the Festival. Hamilton has been a strong leader in developing green economy and green practices. Mr. Thompson provided a copy of his written comments to the Clerk for the public record and is available for viewing on the City’s website. A record of City of Hamilton council passing the motion can be found here. Yes, it’s true: wind power kills birds. However upsetting this is, it is an issue that needs to be put into context. To use bird deaths to argue against clean, renewable wind power may be unnecessarily confusing the issue. Renewable energy, including wind power, is something naturalists support. I realise that nearly everything we do has an effect on environmental, animal, and human health. It’s a matter of smart choices, balance, and of mitigating the detrimental effects of our actions. In terms of bird deaths, the experts say that wind power is the best option. Cats Hundreds of millions. A study in Wisconsin estimated that domestic rural cats kill about 39 million birds annually in that state alone. The data in the chart above is from 2002 and wind power has grown much since it was published. However, even with the increase in wind power, the number of related bird deaths can be considered very low when compared to other causes. According to the Global Wind Energy Council, the US’s total installed wind power capacity has increased by just over 8 times since 2001. Very roughly estimating the wind turbine bird deaths from the chart of 33,000 by a factor or 8.2, results in around 270,000 bird deaths caused by wind turbines in 2009. Still a very small number compared to other causes of bird deaths. However, is there anything we can do to reduce/eliminate bird deaths, and invest in clean, renewable wind power? What do the bird experts say? Let’s have a look at the Audubon Society’s Statement on Wind Power. Some in the anti-wind lobby argue that wind power is not environmental due in part to bird deaths they cause. From what I have read on the issue, it appears that birds are killed when they come into contact with a wind turbine blade. “Every source of energy has some environmental consequences. Most of today’s rapidly growing demand for energy is now being met by natural gas and expanded coal-burning power plants, which are this country’s single greatest source of the greenhouse-gas emissions that cause global warming. If we don’t find ways to reduce these emissions, far more birds—and people—will be threatened by global warming than by wind turbines. What can we do to minimize bird deaths? “On balance, Audubon strongly supports wind power as a clean alternative energy source that reduces the threat of global warming. Location, however, is important. Many National Audubon Society Chapters and State Programs are actively involved in wind-power siting issues in their communities. Let’s get on with investing in our renewable energy future. However, let’s follow the Audubon Society’s lead and work with the industry, community groups, and residents for a cleaner and healthier future for all. Now that’s a policy for the birds!